Lush green paddy fields surround Bangaldoba Part II, a small village of about 250 households in Assam’s Kokrajhar district. On July 23, a murderous mob attacked the village of Bodo tribals, reducing it to charred rubble. “Thousands of Muslims came on foot and by boats and surrounded us from three sides. We did not know who they were, but they torched everything on their way,” recalls Laisan Bramho, a 38-year-old farmer of the village. He narrates the incident as he makes his way into his courtyard where tin sheets lie heaped on piles of burnt timber and bamboo. They did not even spare the trees, Bramho says, pointing to a few areca nut trees, chopped down to a third, their leaves crumbled by the heat from the houses set ablaze. Kokrajhar and Chirang are part of Bodoland Territorial Autonomous Districts (BTAD), an autonomous area for the Bodo tribals created in western Assam under the Sixth Schedule of the Constitution . The region is a tinderbox that needs only a spark to implode. The past two decades have seen at least four bloody and violent confrontations between the Bodo tribals and Bengali Muslims, considered illegal immigrants from Bangladesh. A report by non-profit Norwegian Refugee Council published in November 2011, This is Our Land: ethnic violence and internal displacement in north-east India, estimates that close to 0.5 million people were displaced between 1993 and 1998 in three different violent events, all involving the Bodo. Of these, close to 50,000 are still living in refugee camps and need rehabilitation. In 1993, the violence between the Bodo and Bengali Muslims had claimed about 50 lives and displaced about 250,000 people. This time, the riot which erupted in mid-July, had claimed 65 lives and displaced 400,000 people till the time this magazine went to print. The genesis of the violence in ethnically-sensitive western Assam, BTAD in particular, lies in a series of historical blunders, right from the colonial period to bad policy decisions in recent times, favouring a particular community. In the 19th and early 20th century, policies of the British administration on land utilisation and settlement of people brought from outside Assam to work in tea plantations and farmlands led to massive demographic changes in the region (see ‘Bodoland incursions’). But more recently, social scientists point out, giving territorial autonomy to the minority Bodo community with scant regard for the majority, which includes Muslims, Adivasis, Koch Rajbongshis and Assamese, seems to have been the main reason for the violent discords that erupt time and again. As early as 1765, some of the districts that form the Bodoland Territorial Autonomous Districts were part of the undivided Goalpara district of East Bengal (now Bangladesh), then under the British rule. The regular incursion of immigrants into the Bodo area began after the princely state of Assam came under British rule in 1826 following a treaty with the Ahom rulers. The British started commercial tea plantations in Assam about 10 years after acquiring the territory. They saw potential in huge tracts of forestland that could be converted into tea estates. But labour was a problem. Numerous wars with the Burmese between 1817 and 1826 had decimated Assam’s population. The British decided to bring labourers from the area around Chhotanagpur Plateau and other parts of eastern India. Along with the tea garden workers came others who worked as cultivators and eventually settled in Assam. They are mostly known as Adivasis. The Bodo and Adivasi practiced shifting cultivation or jhum, but the migrants from East Bengal knew modern methods of farming using a plough. They were settled in what the British had termed as wasteland. But the land was actually grazing reserves and jhum land. Guha notes it was the British who started the process of land alienation among the Bodo. The Bodo began using the plough and started wet rice cultivation only in the early 20th century. With settled farming and pressure on land resources, the demand for a separate Bodo state emerged. Since the 1960s, there has been a demand for a separate state of Bodoland after regulations failed to protect the Bodo from land alienation (see ‘Alienated time and again’). 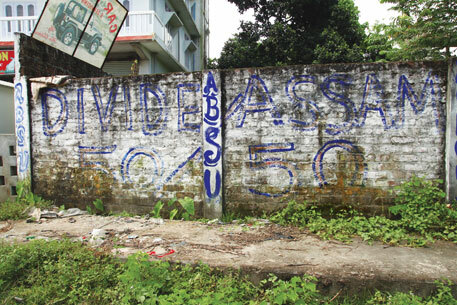 The demand for a separate state gained wide currency only in the late 1980s, when the All Bodo Students Union (ABSU) took up the issue and paralysed western Assam for almost half a decade. “Divide Assam 50-50,” was their slogan. In 1993, the protests led to a bipartite agreement between ABSU and the Assam government, which paved the way for the creation of the Bodoland Autonomous Council, a self-governing body. 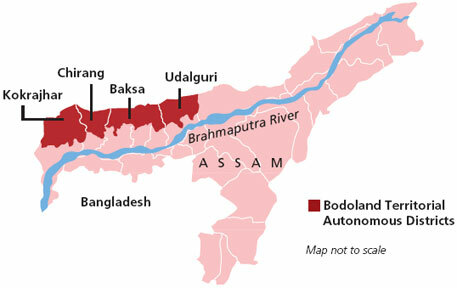 Villages with over 50 per cent Bodo population were to be ruled by the council. To create a contiguous territory, even villages with less than 50 per cent Bodo population could be added to the council area. However, its territory was not precisely demarcated, leaving room for confusion. Lack of financial powers to the council and constant interference by the state government on subjects that the council was to handle meant that the accord never got implemented. By 1994, the political setup, ABSU, which hoped to rule Bodoland revived the demand for a separate statehood. Two separatist outfits, the militant Bodo Liberation Tigers (BLT) and the National Democratic Front of Bodoland (NDFB), also came into being and joined the struggle. In February 2003, a second pact was signed between the Union government, the government of Assam and BLT. The pact paved the way for Bodo Territorial Council (BTC) and its administrative area, the Bodo Territorial Autonomous Districts. In 1999, BLT had agreed to a ceasefire so that it could negotiate with the government. On December 6, 2003, it formally surrendered arms so that it could form BTC. Nani Gopal Mahanta, professor of political science at Gauhati University in Guwahati believes that the 2003 Accord, instead of laying the foundation for peace, created more trouble in western Assam. Mahanta argues that the premise on which BTAD was formed is erroneous. The main objective of the treaty, as mentioned in section 2, states that creation of BTAD is “to fulfil economic, educational and linguistic aspiration and preservation of land rights, socio-cultural and ethnic identity of the Bodo”. This implies that the only agenda of BTC was to benefit the Bodo who are not the majority of the population in the autonomous area. The Bodo only form a majority of the Scheduled Tribe (ST) population in BTAD. This is when, according to the 2001 Census, the STÃ”Ã‡Ãªcommunity in the autonomous area was only about 35 per cent, with Baksa district of BTAD having the highest of 38.10 per cent. Sometime in early 20th century, the colonial administration introduced the “Line System” in Assam to contain conflicts between the indigenous and the migrant population. Under the system an imaginary line was used to keep the communities segregated. While the stated intention of the British was to protect tribal land, in reality, it was part of the colonial divide and rule policy. The real demand for protection of tribal land came after Independence. In 1947, the Bordoloi government agreed to set up tribal belts and blocks and amended the Assam Land and Revenue Regulation of 1886. But due to bureaucratic apathy and shortfalls, the rules failed to stop non-tribals from settling in tribal areas. The list of communities that were allowed to hold land transactions in tribal areas was a long one and included plains tribals, hill tribals, tea garden labourers, Santhals, Nepali cultivators-graziers and Scheduled Castes. The rules had a provision to resettle people displaced by natural disasters like floods and earth quakes and land acquisition by government. The deputy collector of the area was the final adjudicator on who could buy and sell land. Muslim cultivators who settled in the char (river islands) and chaporis (low-lying flood-prone areas) were the biggest beneficiaries of this regulation. BTAD was also created in an arbitrary way. The criteria were similar to the 1993 Accord. All villages with an ST population of over 50 per cent were to be part of BTAD to create a contiguous area. To create this mini state within a state, the borders of close to a dozen existing districts were redrawn and two new districts were created. To do so, the Sixth Schedule of the Constitution was amended. BTAD has four districts—Kokrajhar, Chirang, Baksa and Udalguri, comprising 2,890 villages. Bhupen Sharma, director of Omeo Kumar Das Institute of Social Change and Development (OKICDC), a social research organisation in Guwahati, says although BTAD was formed by amending the Sixth Schedule, it goes against the spirit of the Constitution. The Sixth Schedule envisages protection of tribal land by forming autonomous districts where tribals are in majority. In the case of BTAD, the map of the state had to be redrawn to create an area from several districts. Even then the population that it sought to protect does not form a majority, Sharma says. His institute conducted a sample survey in 300 villages in Kokrajhar for the Ministry of Minority Affairs and found that only 37 per cent of the population belonged to ST communities, while 49 per cent were of general category. Now, there is a strong perception among the Bodo leadership that land in BTAD is slowly being encroached by illegal migrants from neighbouring Bangaldesh. During their recent visits, BJP leaders, including L K Advani, talked about the growing cases of encroachment by Bangladeshi immigrants on the forest and revenue land of Bodo tribals. This is far from the truth says Akhil Ranjan Dutta, professor of peace and conflict studies at Gauhati University. “Encroachment is more of a perceived threat than a reality. There could be a few cases of incursions by illegal immigrants, but it is not changing the demographic of BTAD,” he says. A senior BTAD official disagrees. Illegal immigration may have stopped after the formation BTAD, but enough harm has been done prior to 2003. When BTC was formed, right to ownership of land should have been made with retrospective effect. Since the 1950s, a steady stream of migrants has been flowing to Bodo areas, pushing out native population, he adds. The 1991 Census shows between 1971 and 1991, the population of Chirang increased by 103.33 per cent while in Baksa the growth was close to 74 per cent. The population growth in Kokrajhar and Udalguri was 62 and 43 per cent. But the population growth seems to have stabilised since. According to the 2011 Census, BTAD now has a lower growth rate than the state average of 16.93 per cent. For long, farmers in Assam follow a practice, called adhi in Assamese or Bodo dialect, according to which landed farmers lease their agricultural land to farm workers who cultivate in exchange for half the produce. The other half is given to the farm owner. Bikas Bramho, 26, a resident of Nilibari village in Kokrajhar, says farm workers from the neighbouring Khujiabasti village, a Muslim settlement, usually work on their fields. Laisan Bramho whose house in Bangaldoba Part II was burnt down during the recent violence says he had employed four to five Muslim farmhands on his 5 acre farm. Dutta concurs, sometimes Bodo families also invite Muslim families to stay on their fields as tenants and cultivate the land. “So much so, lately there has been a trend of renting out fruit bearing trees to Muslim families,” says Dutta. Once the trees begin to flower, the Bodos lease the tree out for a certain sum of money. Once the fruits appear, the person can harvest the produce and sell it in the market. The riot seems to have hit every one hard. 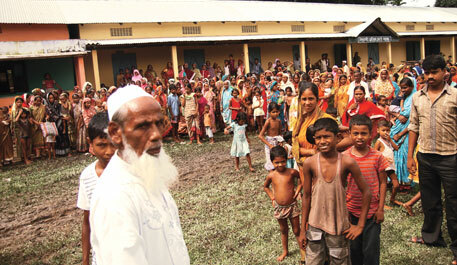 Abdul Hamid who is sheltered in a relief camp in Mazrabari in Chirang after his house was burnt down feels helpless. The 56-year-old farmer used to work as a farm hand to eke a living. When times were good, his farming skills would get him about 200 kg of rice a season. Half of it would be used to feed his family while a rest would be sold in the market. “I generally manage to save about 100 kg of rice per season. I sell it after a year because old rice does not stick to each other once cooked and fetches a better price,” he says. But after the violence there is no rice left in the house. 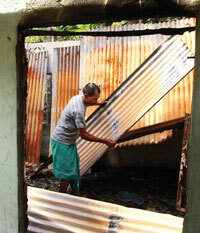 It is a double whammy for Hamid since he will not find work on Bodo field and his granary has been burnt down to ashes. Little socio-economic study has been done in BTAD. Even the government of India’s socio-economic caste census of this area is not complete. The only study that gives an indication of the socio-economic pattern in this area is the sample survey by OKICDC. Of the 300 families surveyed, 11.2 per cent of Muslim families were landless. Compared to this, 6.1 per cent Hindus and 8 per cent Christians were landless. But when it came to ownership of agricultural land, a solid chunk of 45.3 per cent of Muslim families owned no land compared to 34.1 per cent Hindu families and 31.8 per cent Christian households. The average agricultural landholding in the state is 36 per cent. It is a misconception that illegal immigrants have taken away the land of the Bodo tribals. Government policies during the colonial period and after Independence have led to land alienation among the Bodo. But trying to rewrite history with violence will not be to anybody’s advantage. Without the skilled Bengali Muslim farmers, the Bodo’s harvest will dwindle. Abdul Sattar’s loss also means a loss for Laisan Bramho. Will the Bodoland council follow the beaten track? Population pressure on vital natural resources are important issues of concern. Assam has six different agro-climatic zones, and the present area of conflict is in the Lower Brahmaputra Valley zone, which represent 9.52% of total geographical area of the state, 12.01% of cropped area of the state and 14.20% of population of the state. Per capita cropped area is 0.070 hecatres only. In such situation, people's livelihood security is in vulnerable situation. At the same time protection of right of indigenous communities is serious issue. With pragmatic planning for natural resource management, livelihood generation plan along with special measures to protection of indigenous community permanent it is difficult restore peace and harmony in the area. Well, I think the author should have considered the Supreme Court's verdict on the illegal immigration issue of Assam and the ex-Governor, SK Sinha's report.